Last weekend, Sin City was home to one of the largest Magic events of the year, and the town transformed as over 5,000 competitors, cosplayers, content creators, and lore lovers descended on the Las Vegas Convention Center. Grand Prix Vegas is unique in the Magic community, as it’s the closest thing to a traditional convention that we typically get. With panels, cosplay contests and wacky side events (did you watch that Beta draft?! ), the main event can often take a backseat to all of the other happenings and meetups taking place. And unfortunately, the main event also ended up taking a backseat to my life. With a recent move eating up every second of my free time, I headed in to Grand Prix Vegas with one league under my belt, and not feeling nearly as prepared as I would have liked. This is my first take-away for myself, and hopefully for you. Whereas I normally hold myself to a high standard (too high, some might say), I knew heading into the tournament that being realistic in my expectations could help negate tilt or disappointment, should the event go poorly. As I felt the rust coming off the tires throughout each round, I know that tempering my expectations was the right call. That’s not to say that I made excuses for myself for sloppy or poor play. In fact, I found that being cognizant of my lack of testing helped me to slow down and think through my decisions, and prevented me from auto-piloting through my turns – a fault I’ve been guilty of in the past. This is a topic I’ve touched on before, but one that I believe bears repeating. In the weeks leading up to Grand Prix Vegas, I struggled with two options: playing the best deck in the format, Humans, or playing my old faithful, Grishoalbrand. Grishoalbrand is a rogue deck that is often viewed as a “tier two” option, but one that I have infinite practice with. I had been hoping to get in enough reps to feel comfortable piloting Humans against a field that was surely going to be prepared to fight it, but life ended up getting in the way a bit and that didn’t end up happening. In the tournaments leading up to Grand Prix Vegas, it also looked like Humans had been on a bit of a down-swing, with decks like Jeskai Control, Tron and Mardu Pyromancer rising up to combat it. Attempting to look at this metagame objectively, my second option became much more appealing. Grishoalbrand was favorable against all of the decks that were poised to take down Humans, so if I could slog it out through a Humans-heavy field Day One, I could hope to be well positioned in a control- and Tron-heavy Day Two metagame. With these factors in mind, I ended up registering four Griselbrands and four Worldspine Wurms. While I somehow didn’t end up playing against Tron or Jeskai the entire weekend (and only got paired against Humans once), looking at a Top 16 with six mono-green Tron decks, I feel like my decision to sleeve up Grishoalbrand was sound. Long days take mental fortitude. While slowing down and thinking through your decisions is good, having your day paused with a three hour break between Rounds Two and Three is not. Although it’s nobody’s fault, unexpected technical difficulties meant that after arriving at the venue at 11am (after two byes), my first round didn’t begin until 3pm. Sitting around and waiting for your round to begin may not sound particularly mentally taxing, but when you get to Round Eight at 10pm, it definitely begins to take a toll on you. I can only imagine the experience for those players who had been there since Round One and were in for a fourteen hour day. I have often lamented that my focus seems to go downhill towards the last few rounds of a day – I find myself making more rookie mistakes and just generally feeling like I have a harder time keeping track of board states and navigating complex decisions. My solution thus far has simply been to get more long days in under my belt, and with this particularly long day in the history books I’m hoping to be an expert at them now. With hindsight being 20/20, I’m not sure that I handled the long break as well as I could have. At the time, being unsure if the event was going to continue on at all, I decompressed with friends and left the venue to get some ice cream. It might have been correct to jam some games and keep focused, or maybe even take a nap in preparation for the potentially long day ahead. However, I believe that different people prepare and maintain their focus in different ways, so it really is a matter of trial-and-error to see what works best for you personally. Learning from losses is just as important as learning from wins. This is a lesson that I find incredibly important, and always worth repeating. I find that Magic players often dismiss their losses to mana issues or top-decks without deeply examining the lines of play that lead to that loss. The best players in the world, when stuck on three mana, will maximize their plays in spite of mana issues. Or when facing down an almost insurmountable board state, setting up for the two or three draws that they need to get themselves out of that bind. But they also look at their losses (and their wins) and think “what could I have done better?” Magic is game of compounding, infinitely small decisions, each one providing you with an edge (or your opponent with an edge), so to think that any of us play any game or match perfectly is woefully incorrect. During my tournament I felt like I was definitely making errors, even when I was still winning games. Miscalculations as small as choosing what card to discard to a Faithless Looting could end up affecting my route to victory five turns later. I also find it incredibly helpful to write out notes after each match so I can go back and reflect on the match later (though my note taking also seems to suffer at the end of a long day). If my opponent is willing, I appreciate being able to talk through lines of play with them as well, to understand their thought process in approaching different decisions or their worries for threats coming from my deck. Don’t let your mistakes get to you. Growing as a Magic player seems to entail walking the fine line of being hard on yourself in order to improve, and not being so hard on yourself that you’re punishing yourself for your mistakes. During the last round of Day One, I made a misplay that very clearly cost me the game, and with it my ability to qualify for Day Two. It was a rookie mistake at the end of a twelve-hour day, and one that could have been easily avoided if I had been playing more deliberately. While I think it’s important not to shrug this mistake off as “fatigue” or “rust” and hold myself to a higher standard going forward, I knew that there was no point in sulking in my defeat. My energy was better spent cheering on my friends who had made Day Two, and spending the night catching up with people that I hadn’t seen in ages and meeting new friends. 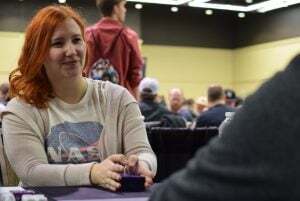 While I may not have many Magic-specific lessons from Grand Prix Vegas, sometimes I think the life lessons and the lessons in how to approach the game are more valuable. Maybe that’s a little cheesy, but going forward I know I will attempt to carve out more time to prepare for important events, and continue to work on playing deliberately and thoughtfully, as well as always trying to have a bit of fun along the way.